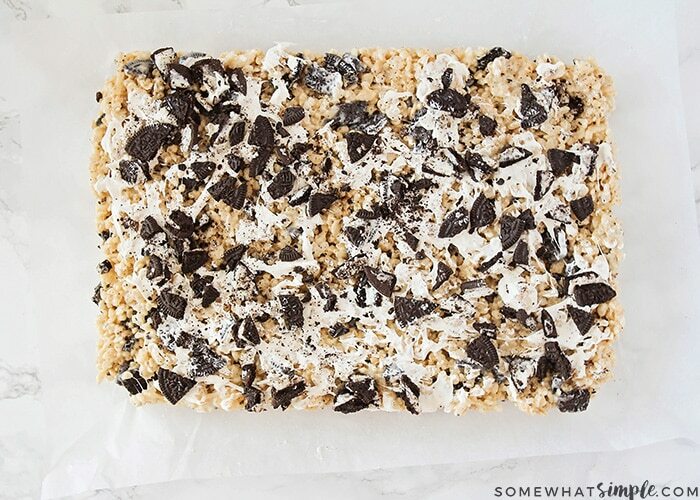 These Oreo Rice Krispie treats are a fun way to dress up a family favorite! 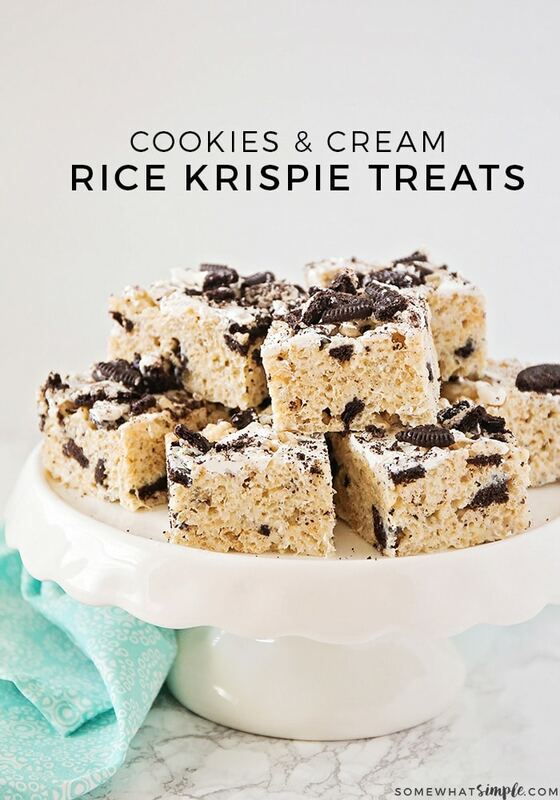 Made with irresistible Oreo cookies and topped with melted white chocolate chips, you won’t be able to put these Rice Krispie treats down. 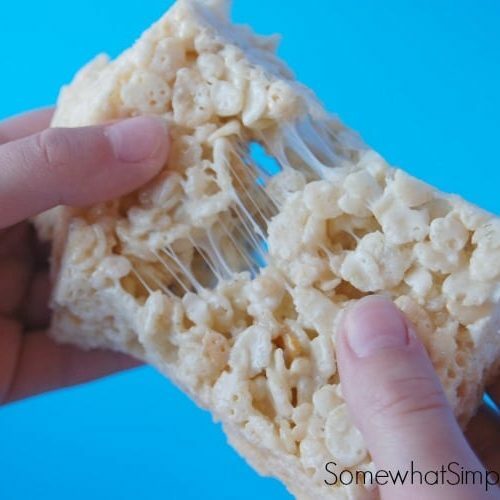 Ready to try my very favorite Rice Krispie Treat?! 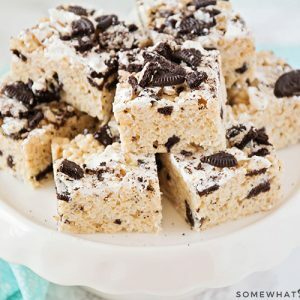 I have always been a fan of all tings cookies and cream so one day when I was making Rice Krispie treats, I figured why not adjust the recipe to incorporate my favorite dessert toppings. So I grabbed some Oreo cookies, melted some white chocolate and voila! 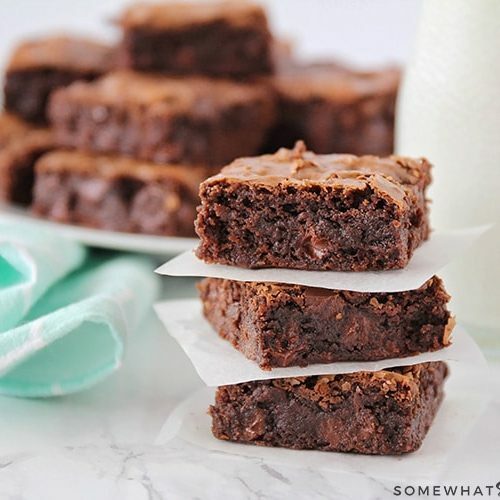 These delicious little treats are crazy good and are super simple to make! 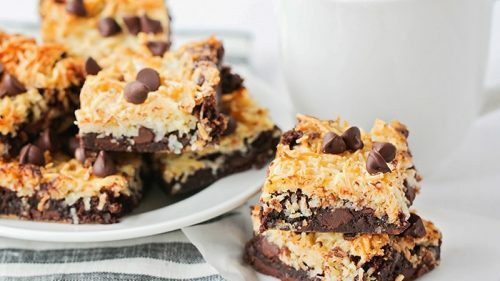 I first served these at a dessert potluck and they were one of the first things to disappear from the table! I think the only bad thing about them is that I can never stop at one – I can easily eat 2 or 3 and not even think about it! 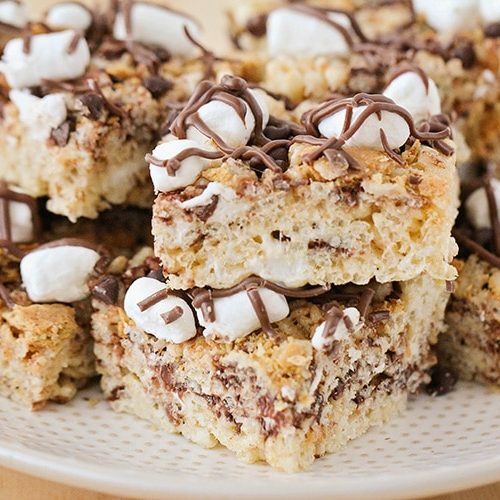 Whenever I make Rice Krispie Treats, I like to throw in extra butter and marshmallows so they are even more gooey and delicious! The white chocolate and crushed Oreos in this recipe will take it to the next level! 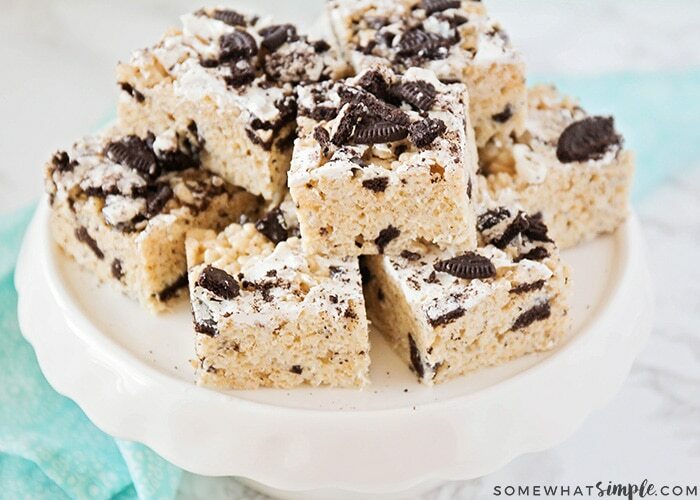 Let us know how much you love these Oreo cookie Rice Krispie treats by leaving us a comment below. Or the next time you server these at a party, tag us on social media so we can see how much fun you’re having! 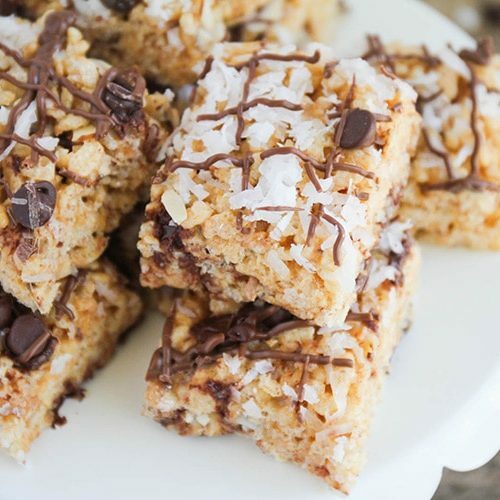 These Oreo Rice Krispie Treats are a fun way to dress up a family favorite! In a heavy pan, melt the butter over medium heat. Add in marshmallows and 1 1/3 cup of white chocolate chips and stir until melted. Stir in cereal and 2 cups of broken cookies. Put into a greased 9x13 pan. Melt 1/2 cup white chocolate chips and drizzle over the top. 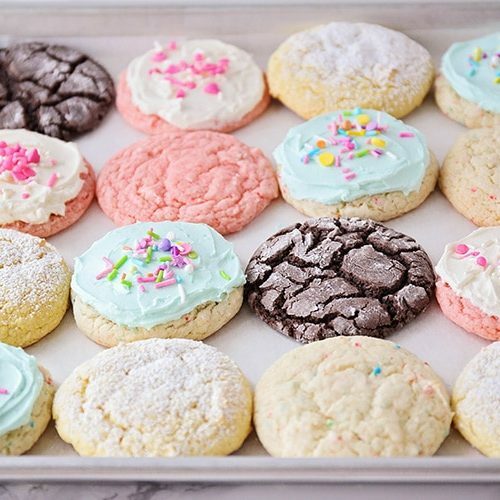 Sprinkle with remaining cookies.Cool to room temperature and serve. About the Author: I’m Leigh Anne and I am excited to be guest posting today! Food, family and friends are three of my favorite things! 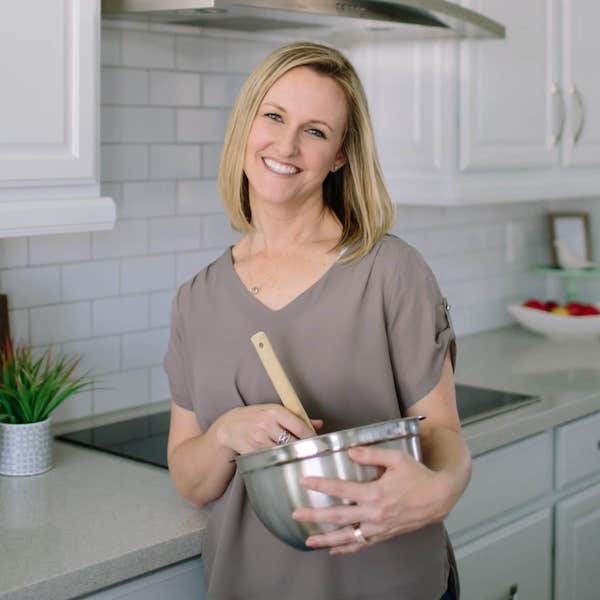 I love sharing my journey of finding and creating the pretty and delicious things in life over at Your Homebased Mom. Omg, looks insanely delicious! Definitely a big hit in our house , need to make this! I’m so glad you guys enjoyed it! Who doesn’t love cookies and cream?! This sounds awesome; I am excited to make this! You had me at Oreo. Wow, these look so good and what a fun twist on a classic! 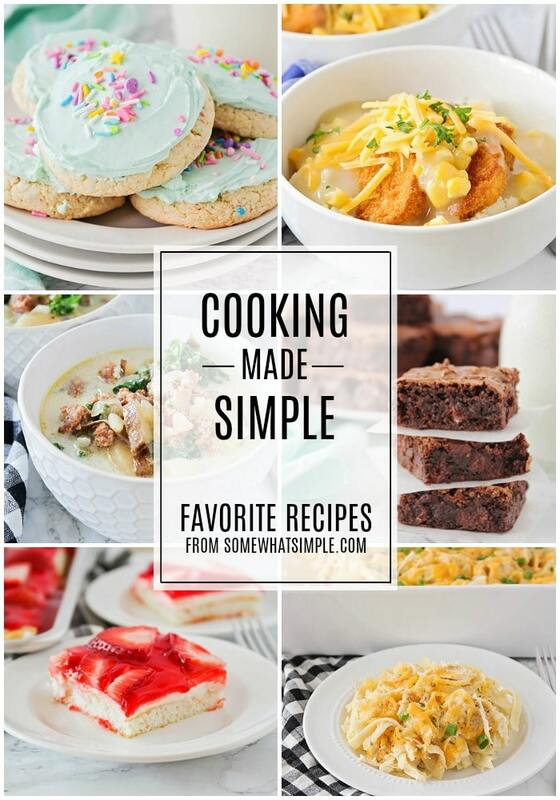 Love the spin on a classic recipe! 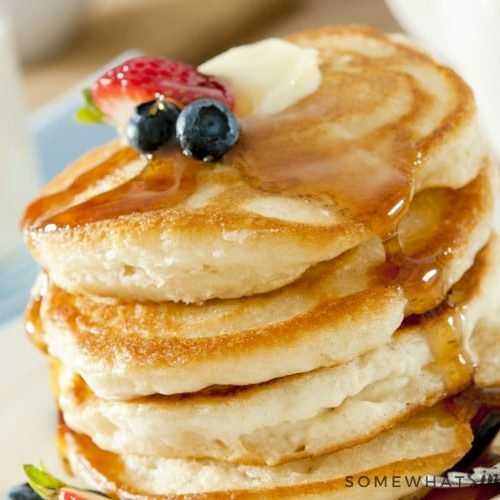 My kids would love to make this…and eat it too! Amazing!! The addition of Oreos takes Rice Krispie to a new devine level!! 10 stars out of 5! I love these two things separately but putting them together is perfection! I’m totally with you. This combo is so good no matter what you’re eating! You definitely should 🙂 SO yummy!